Porcelain veneers are crafted from a high quality, stain resistant material, but they are also covered in a stain resistant coating. This prevents your porcelain veneer from staining when you drink coffee or eat dark foods. Unfortunately, it also prevents your porcelain veneers from being brightened with teeth whitening products. However, your teeth that are not covered with veneers will still continue to discolor and your porcelain veneer will wear down over time, making your smile look less than perfect. 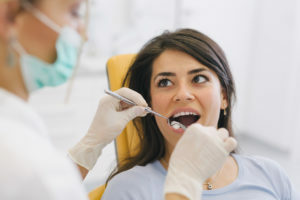 When this happens, you will need to work with your trusted cosmetic dentist to improve the coloring of surrounding teeth and repair or replace your veneers. The key to maintaining the perfect smile created with porcelain veneers is to maintain your daily brushing and flossing routine and visit your dentist twice a year. To avoid unnecessary wear on your veneers, use a soft bristled toothbrush and minimally abrasive toothpaste. Keeping the rest of your teeth healthy is important to ensure you maintain a flawless, natural appearance and avoid the need for early removal and replacement of your porcelain veneers or other more advanced treatments. While you can’t whiten your porcelain veneers, you may be able to brighten the colors of surrounding teeth to more closely match the veneers, so your smile appears more consistently shaded. It’s best to work with a dentist to receive professional whitening in order to avoid damaging your veneers. The Luminous Smile at South Shore Dental Care team has years of experience offering a wide range of cosmetic dentistry solutions, including flawless, long lasting porcelain veneers. If you’re unhappy with the appearance of your smile or current veneer, call our Massapequa Park dental team to find out more about treatment options to deliver the flawless smile you desire. From basic teeth whitening to a complete smile makeover, our skilled dentists and team can help you create a smile you’re proud to share. by: South Shore Dental Care at December 6, 2017 . Comments Off on Can You Whiten Porcelain Veneers?